The Fire Extinguisher That Wasn’t: how robust are your barriers? I recently noticed this fire extinguisher in an office building I was visiting. It would no doubt make for an interesting experiment in human factors if there was an actual fire. Would you try it anyway? Would you rush off to look for another one hoping that it would be OK? Or maybe you would have left the building by now? 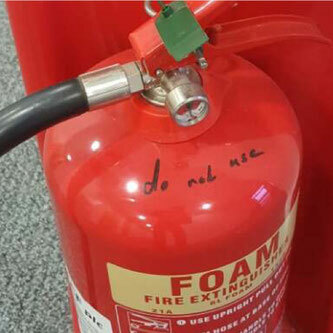 Presumably there is a risk assessment somewhere with this fire extinguisher’s name on it and the people who made the assessment probably have no idea that their lovely shiny red fire extinguisher has “do not use” written on it. For me it highlights an issue extremely relevant to risk management. How do we know how robust our barriers are? We need to determine if a) they are up to the task and b) that they are going to work as intended on when called upon. It’s remarkably common to find that assumptions made in good faith during a risk assessment are in reality way off the mark. In order to manage risk exposure and safety resources effectively we need to reduce this disconnect to as low a level as possible. How are we going to do that? 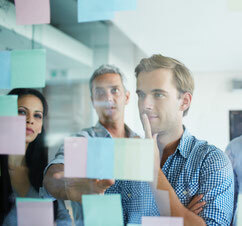 By developing and maintaining an effective feedback loop between operations and risk assessments. Lots of data but how do we get the maximum benefit? The aviation industry has lots of data sources: audits, flight data monitoring and safety reporting to name just a few, but how often do audit results and the safety reports find their way back into the relevant risk assessments? How often are the risk assessments reviewed and updated given this new data? As you might have guessed, this is one of the reasons why I like BowTie so much; it provides a solution to these problems and lets us integrate proactive and reactive data via the add-on software AuditXP and IncidentXP. In future articles I’ll be looking at some of the specific techniques we can use to make this happen. It's a very informal way to collect data but here’s a challenge: if you have a BowTie that deals with an operational risk, print it out and put it up in a place where the staff it refers to are able to access it. Attach a pen and an invitation for them to comment on the barriers and your effectiveness scores. You might be surprised at what you learn. I’ve seen this done a couple of times and the level of engagement was impressive. As you might imagine some respondents were more, well lets call it ‘emotional’, than others but overall it provided a very easy way to connect the risk assessment and the real world. By the way, in case you’re wondering, I noticed the fire extinguisher about 4 months ago. And yes, I mentioned it to the building management who expressed their sincere concern. And yes, 4 months on and the fire extinguisher is still there and the risk assessment that refers to it no doubt still shows it to be an excellent barrier.